I’m mixed on residential solar: I love to see grassroots movement to expand solar but I’m skeptical about the ROI for widespread adoption. I’m a believer in local solar as a way to regionalize generation. Municipal solar sites (including commercial and manufacturing) would have scale and facilities maintenance that can generate a meaningful ROI. If the Federal Government is serious about energy independence, then our schools are the ideal place to start. The US should pay 100% of the cost to install arrays at every school in the country and allow the individual schools to use the energy savings/revenue to offset their facilities costs. Just supplying this one initiative would consume the output of multiple PV factories! The demand created would be enough for a VC feeding frenzy in PV speculation. Schools are tightly integrated into our communities, high visible, and mandated to educate. Solar schools would have tremendous and immediate community impacts with both economic and the social activism benefits. Let’s set a goal for our schools to become energy neutral (or better) in 3 years. It would be a bold statement to a huge audience that we’re serious about energy independence. Now that’s something that students everywhere could sing and dance about! 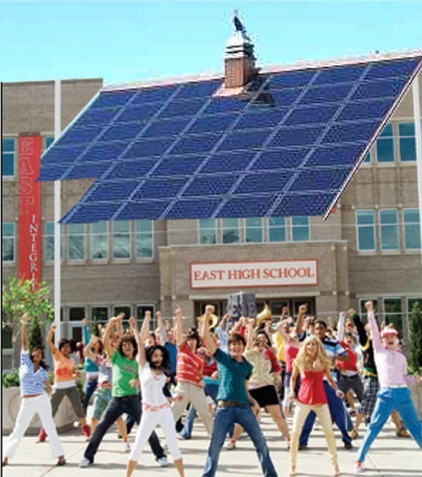 Solar powered high school? Now that is something to dance and sing about! I believe that people must have a long term view to support sustainability. Unfortunately, this is not a natural state for most of us raised in an immediate gratification culture. This point was doubly reinforced recently. First, Matthew Simmons comments about creating a oil price floor to allow investors to make long term plans. Second, a conversation with a municipal / civil engineering friend about Austin’s commuter rail vs. buses. He said that rail project build a sustainable community around them because the businesses and residents can count on the transportation asset. The exact same infrastructure using buses would not create the community because buses are not community assets. Rail project create sustainable communities, buses do not. BTW: I found another interesting link from AutoBlogGreen about a Japanese project to turn their rail beds into green spaces. They cited a dramatic drop in temperature (140 vs 95) between road and greened rail. Just the place for a picnic Father Bear! On Cinco de Mayo, I was talking to an environmentally minded friend over lunch at Maudi’s and chewing on weighty problems. He suggested that the Free Rider Problem from Game Theory may be part of the struggle for conservation movements to get rolling. The FRP states that when a populate is large enough members can easily opt out of paying their share. By assuming that the majority will contribute they get a free ride. If enough people do this then the market collapses or fails to advance. This certainly explains some of the behavior that prevents emergent conservation, but I think there is also an overwhelming boil the ocean phenomena at play. It’s currently impossible for individuals to see any practical connection between their drop of wastefulness and a world wide problem. There are many instances in which the national zeitgeist shifts from ignoring widespread intractable problems into addressing them aggressively as enforced social norms. For example, littering in the 70s, polyester in the 80s, smoking in the 90s, and recycling in the 00s. The tide is turning, but it’s still too hard for people to measure the benefit.